The term is generally used only to describe systems serving relatively small areas such as airports, downtown districts or theme parks, but is sometimes applied to considerably more complex automated systems. he term was originally applied to two different systems, developed roughly at the same time. Generally speaking, larger APMs are referred to by other names. The most generic is “automated guideway transit”, which encompasses any automated system regardless of size. Some complex APMs deploy fleets of small vehicles over a track network with off-line stations, and supply near non-stop service to passengers. These taxi-like systems are more usually referred to as personal rapid transit (PRT). Larger systems, with vehicles with 20 to 40 passengers, are sometimes referred to as “group rapid transit” (GRT), although this term is not particularly common. Other complex APMs have similar characteristics to mass transit systems, and there is no clear cut distinction between a complex APM of this type and an automated mass transit system. 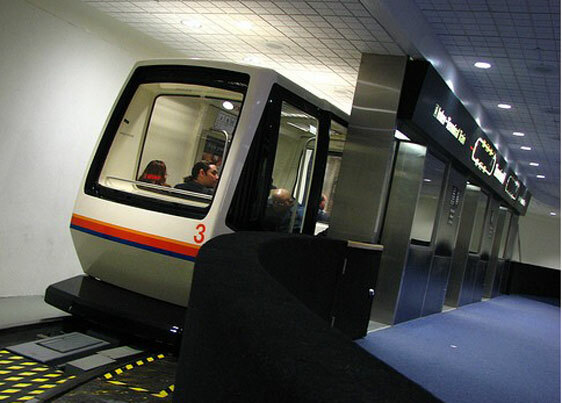 The term “people mover” is generic, and may use technologies such as monorail, duorail, automated guideway transit or maglev. Propulsion may involve conventional on-board electric motors, linear motors or cable traction. Driverless metros have become common in Europe and parts of Asia. The economics of automated trains tend to reduce the scale so tied to “mass” transit, so that small-scale installations are feasible. Thus cities normally thought of as too small to build a metro (e.g. Rennes, Lausanne, Brescia, etc.) are now doing so.